Stampin Up is having a one day sale on a Paper Pumpkin subscription for new subscribers only. If you’ve never tried Paper Pumpkin, now is the time to jump in with both feet! The one day special pricing is $5.00! For the price of a latte, you can start a monthly subscription to Paper Pumpkin. This special is only for ONE DAY. Don’t miss it! Paper Pumpkin kits are nice because they include everything in the box you’ll need to make your kit: precut paper, adhesive, stamps, and ink. If you’re a subscriber, the kit will arrive at your home around the 15th of the month. And it will be a surprise until you open the box. That’s right, there’s no preview. I can’t wait to see what’s in that package! I do realize that sometimes the kit comes and it’s not exactly what I would have wanted. When this happens, I change it up. For example, here is the card from the May Paper Pumpkin assembled exactly per the instructions. It’s cute. 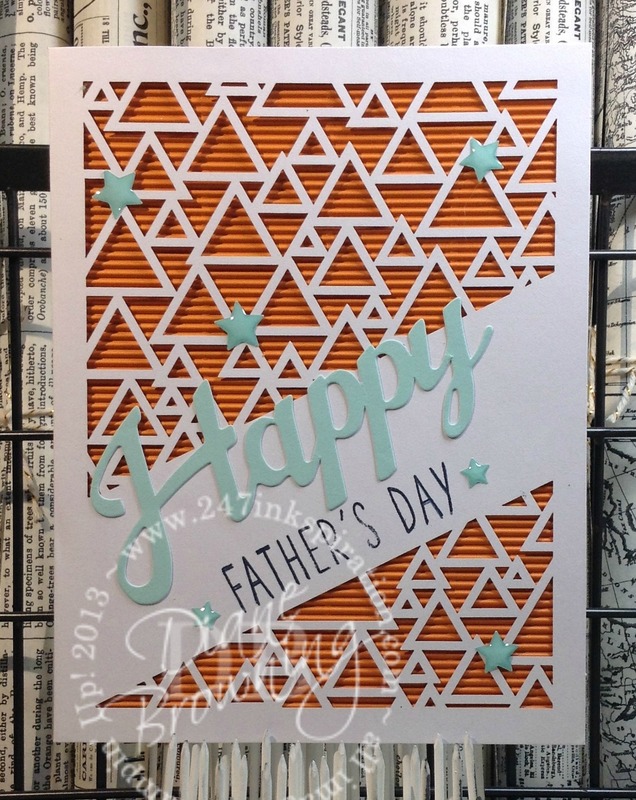 I love the die cut overlay – that’s pretty fabulous. Love those blue epoxy stars! But orange is not my favorite. Do I really want to make eight cards in a color I’m not excited about? Hmmm…. probably not. So I substituted a different color of cardstock for the orange. I used Sweet Sugarplum on the left and Flirty Flamingo on the right. The “Happy” came only in the blue. 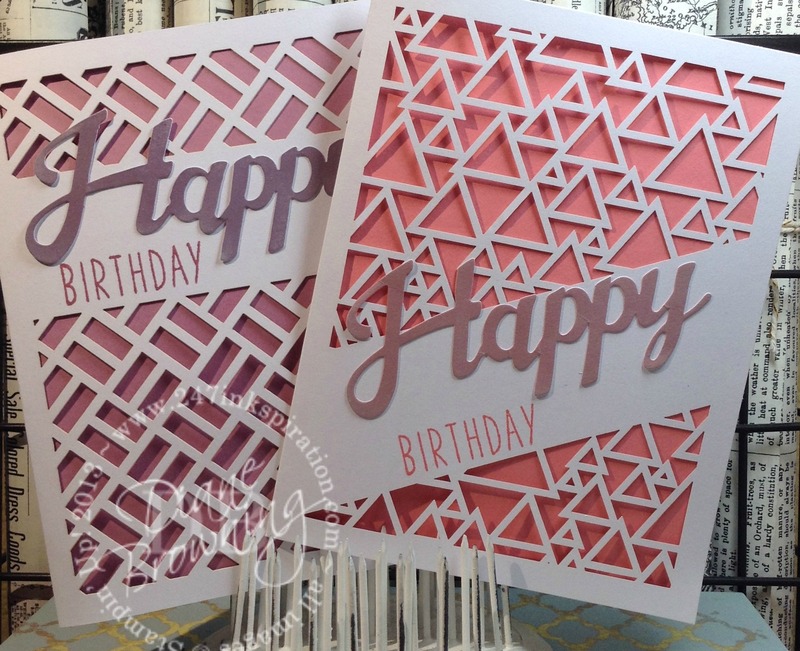 I used sponge daubers and my Sweet Sugarplum and Flirty Flamingo ink pads to ink the “Happy” so it would better match the colors of my card stock panels. Much better! I did omit the blue epoxy stars. I’ll probably add either rhinestones or some other epoxy shapes in another color when I know who’s getting these cards. Now that you’re convinced you need to get this kit coming to your mailbox every month, you’re probably wondering how to go about signing up. It’s super easy! Click the Paper Pumpkin link on the left hand side and use promo code “onedaydeal”. You should see my name as the Demonstrator that you’re subscribing through. First time subscribers only. 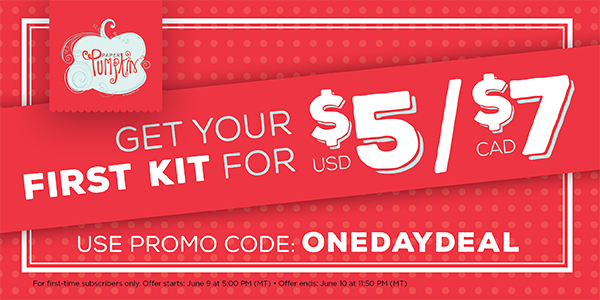 Discount applies to the one kit for June 2016.